For four days, December 30-January 2, I was alone here in North Texas; Christy and the boys remained in Bay City for more time with family. I returned early to preside at a wedding and preach January 3 at Lectio. I knew of this extended time alone for a long time, so I made preparations for entertainment: HBO was going to re-air the entire Game of Thrones series. I binge-watched it last Spring before the new season began in April 2015, so I thought I would go through again. I watched Season 1, but then quit at the beginning of Season 2. I had heard of two new Netflix series I wanted to watch, Jessica Jones, a Marvel series, and the documentary Making a Murderer. I added both to my queue and began with Jessica Jones. I really enjoyed Daredevil from earlier in 2015, but, so far at least, JJ isn't up to that level. I've started and stopped a couple of times. I still have about an episode and a half to go. Regardless of how it ends, it would have been a much more effective experience if the series was 8 or 9 episodes, not 13. 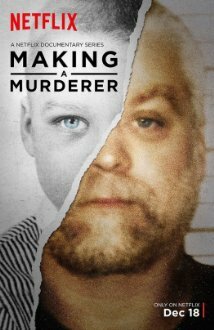 Making a Murderer, on the other hand, is exhilarating. I could not stop watching it. I started the first episode the other night. Christy came in halfway into it and finished it, then fell asleep on the couch and went to bed during the second. I stayed up past midnight to get through four episodes. Netflix does not announce its viewership numbers, but my Twitter and Facebook feeds have been exploding for weeks about the series. It has to be in the millions of viewers, and still growing. It's the story of one family's ordeal at the hands of the justice system in Wisconsin over the past thirty years. Steven Avery was convicted of a sexual assault in 1985. Despite his constant claims of innocence, he served 18 years until DNA evidence cleared him. He brought a wrongful prosecution lawsuit against his home county, and as that suit was ongoing, literally weeks after several in the Sheriff's department were deposed (2005), a woman went missing in the area. She could be traced to the Avery property on the last day anyone heard from her, and the county immediately suspected Steven Avery. His 16-year-old nephew was interviewed as part of the larger investigation, and after being led by investigators, admitted to killing the woman with his uncle. He has vacillated between the details offered in his confession and professing his innocence from the very beginning until today. Steven Avery proclaimed his innocence from the very beginning. Evidence offered at trial at best raises the suspicion that the Sheriff's department planted evidence and framed Avery because they absolutely believed he was guilty, but also as a response to the pending lawsuit. Both men are still in jail today, their repeated appeals denied. This is not meant to be a Reddit commentary page on the details of the case-- you just have to watch it to get the depth of information and emotion. What I am interested in is how any of us, at any time, could be subject to the same ordeal Avery and his family have endured. He has spent more than 30 years of his life behind bars and has no possibility for parole. His nephew will be eligible for early release in 2048. I don't know how many times I thought, or sometimes yelled out loud, "How is this even possible?" That question has been the theme of several shows and movies I have seen recently, as well as one I have not watched yet: The Big Short, Spotlight, (both reviewed here) and Concussion. Concussion (I have not seen it) challenges our trust in the NFL's ability to protect its players in the face of huge profits and our insatiable appetite for football; The Big Short questions our trust of the financial system; Spotlight casts doubt on the institution of the Church; and Making a Murderer has a similar impact on the judicial system. Where do we turn, where do we put our faith and trust, if these and other human institutions continually fail us? Last night in Bible study we discussed the issue of salvation. Over and over I asked these questions of the group: "Do we need to be saved? From what?" "What does it say about the nature of God that God wants, and acts, to save us?" We read parables of Jesus and teachings of Paul from Luke 15 and Romans 5 that speak to the character of God, our human nature, and our need for salvation. Humanity lives in a constant struggle with sin-- on a personal level (individuals sins, like greed, lying, adultery, etc. ), but also on a communal level-- what we think of as institutional sin: racism, economic injustice, etc. These movies and shows speak to our fear that our societal systems are rigged against the poor, the outcast, those without power. This is where the #BlackLivesMatter movement becomes part of the conversation. "One, that God created a world which is imperfect. Two, that we are partners with God in improving the world. In Hebrew, we use a compelling phrase to describe the purpose of that partnership: tikun olam, which means 'mending the world.' God seems to have left a lot of important tasks for us to do. That is our purpose on earth-- to help finish the job God began" (103). By the final couple of episodes of Making a Murderer, I was eager to find out what had happened: what missing piece of evidence exonerated Avery and his nephew? What unexpected legal argument compelled the courts to grant new trials for both? And I was frustrated, heartbroken, to hear all of those attorneys who had tried to help across thirty years say they were still waiting. Those guys are still in prison, and they may be for many years to come. That is not okay, and it is not just. As I said, they may be guilty-- but they at least deserve the chance to argue that their cases were heard fairly and without obvious bias and coercion. So we must wait, not just for this terrible episode in Wisconsin, but anywhere folk suffer injustice. In the meantime, we maintain our identity as people who belong to the Lord. In Lectio worship yesterday we remembered our baptisms, the outward sign of God's promised salvation, and heard these words read aloud: "Don't fear, I have redeemed you; I have called you by name; you are mine. When you pass through the waters, I will be with you; when through the rivers, they won't sweep over you. When you walk through the fire, you won't be scorched and flame won't burn you (Isaiah 43:1-2).